Wearing Burberry dress, Fendi cuff, Dior pumps and fantastic RED Lip, she was oozing oomph from head to toe. The signature collection of seven matte shades were chosen by seven L’Oreal Paris ambassadors, including Aishwarya, Sonam Kapoor, Freida Pinto and Blake Lively. “For me personally, red lips exude power and elan. 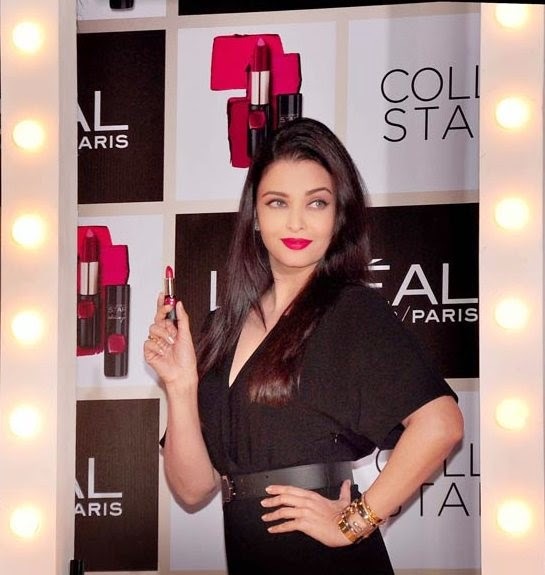 Congratulations to L’Oreal Paris for introducing a range of red lipsticks that are at once urbane, classy and radiate confidence as it flatters every skin tone and adds a beautiful dimension to the lips,” Aishwarya said. “Every woman should find her perfect red lipstick for the added touch of glamour and flair to her overall look. I say this – because you’re worth it!” she said. “I don’t think people are scared… they are just furious with the response of the colour. The trend has been growing and red has already hit out and it is only growing popular. I am confident how well red is accepted as a colour,” she said.